The latest salvo in the foie gras wars comes not from a court room, city council meeting, or state legislature, but from an advertising industry forum that reviews disputes over truth and accuracy in advertising. The National Advertising Division (NAD) of the Council of Better Business Bureaus announced in a press release issued yesterday that it has recommended that D’Artagnan Inc. discontinue certain advertising claims made for its foie gras products. As part of the advertising industry's "self-regulation" program, the NAD considers cases involving disputes over truth and accuracy in national advertising. While the complaints are typically made by an advertiser's competitors, in this case the challenge came from an organization, the Humane Society of the United States (HSUS), which has been pursuing a vigorous, multi-faceted campaign against foie gras production. NAD reviewed D'Artagnan's "Internet advertising" (essentially, the D'Artagnan website) following a challenge made by HSUS over two "express claims" about its foie gras: (1) "The liver is not diseased, simply enlarged," and (2) "Animals are hand-raised with tender care under the strictest of animal care standards." The Humane Society argued that these claims implied a series of messages it deems false, namely that artisan duck foie gras is "not produced by force feeding, "produced by healthy animals," and"produced humanely." Following a review of evidence submitted by both sides, NAD concluded that D'Artagnan had not adequately substantiated the first claim about the health of the duck liver. It also found that the second claim about how the ducks are cared for "suggests a level of care and oversight that is not supported by the evidence provided by the advertiser and is inconsistent with the evidence in the record." In response to the NAD recommendation to disband the two claims, D’Artagnan indicated that it "strongly disagrees with NAD’s decision but nonetheless will comply and modify its advertising." A visit to the website shows that D'Artagnan has replaced the disputed language. The statement that "The liver is not diseased, simply enlarged," which appeared in a backgrounder on foie gras, now reads "According to published research * (partially funded by animal welfare agencies), the liver is enlarged but not diseased" (two sources are cited in a footnote). 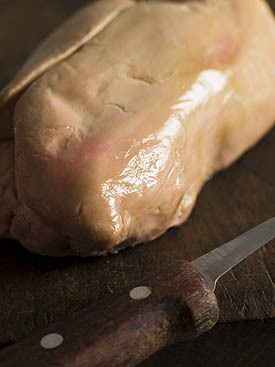 The reference "Animals are hand-raised with tender care under the strictest of animal care standards," which appeared in a product description for Sonoma Valley Ready-to-Cook Artisan Duck Foie Gras Lobe, now reads "The ducks are hand-raised with tender care, surpassing governmental requirements." When reached for comment, Lily Hodge, Director of Public Relations at D'Artagnan, said that the company considered appealing the NAD recommendation, but determined that pursuing such an action would be onerous: "We don't have the lawyers, the time, and the budget to do that," she said. "We don't have a battery of lawyers like they do." Good point about linking to HSUS (I have updated the post with a link to the campaign page). The links to D'Artagnan are only there in order to point readers directly to the sources of the language disputed in the challenge. As there are no governmental requirements for the care of food animals, I guess if the animals are alive at all they are "surpassing governmental requirements." Food animals are exempt from the federal Animal Welfare Act and all state animal cruelty laws. They have no legal protections except during the slaughter process, and poultry are exempt even from that. Fraudulent advertising! Thanks for posting this story, but I am curious why there isn't a single link to The Humane Society's website regarding foie gras where there are three links to D'Artagnan. See for yourself how foie gras is "made"; you'll never see this on your prime time TV! The information on foie gras was helpful. I'm sure other readers too will benefit from reading about Diputed language used. Sometimes advertisements looks too fake, so fake that even kids can understand the truth. Glad to know there is a board which is regulating these issue. Censor boards have to tighten rules. i see that whole lobe in the picture and i think "man i wish i could afford that whole thing!"